SXSW 2016: SAMSUNG debuts Hum On! app that turns your hums into Symphonies. At this year's South by Southwest (SXSW), Samsung Electronics will showcase for the first time a trio of secret projects from C-Lab-an innovation program that helps its employees to nurture their own creative business ideas. 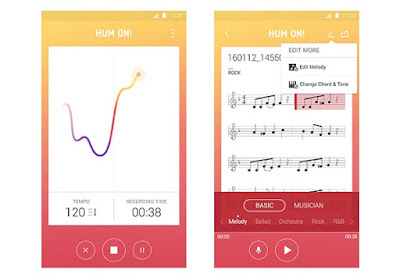 These projects include Hum On!, an app that transcribes hummed melodies into musical scores. As the projects are still in the development stage, they are being showcased to assess their market potential and to gather feedback from attendees at Austin's annual tech and music festival. Hum On! is an app that allows just about everyone-from industry veterans to the less tonally-aware-to score, arrange and share hummed melodies in mere minutes. Think of it as a musical translator of sorts. The app records hummed melodies, instantly transcribes them into musical notation, and then plays it back to you using your preferred arrangement style: R&B, classical or rock. You can then share your own unique songs via social media, or use them as background music in videos without having to worry about copyright infringement. The app utilizes analysis software to detect the pitch and duration of a user's voice, and machine learning to create a suitable accompaniment in the same way a musician considers melody and chords. Compared to similar existing programs, Hum On! is incredibly simple and user-friendly-two characteristics that make the app accessible to all. The team is currently focused on improving the recognition accuracy of the app, and is even considering collaborating with musicians to provide more diverse, artist-inspired accompaniments in the future. You can get hands-on with all three of these C-Lab projects at South by Southwest from March 13 to March 16, 2016. The projects will be showcased at Stand 1710 in Exhibit Hall 2 of the Austin Convention Center in Austin, Texas.